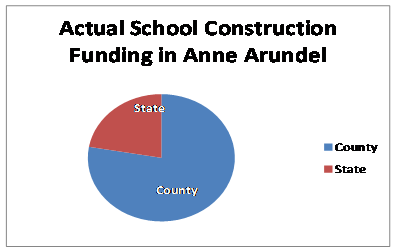 Each county in Maryland contributes towards school construction costs for Maryland’s K-12 school system. The total contribution of all counties statewide is significant. While the State has fulfilled its aim of investing $250M per year since 2004, and Governor Hogan has proposed to continue a high level of school construction funding, counties allocated $981M for capital projects in K-12 education in FY 2014 alone. The portion of building expenses that the State pays is based on the relative wealth of a county, providing more assistance to counties who are poor, according to a certain formula. Even in these counties, however, the State only contributes funding towards eligible costs, such as building and site development, renovation and limited renovation, leaving the counties to absorb all of the rest. 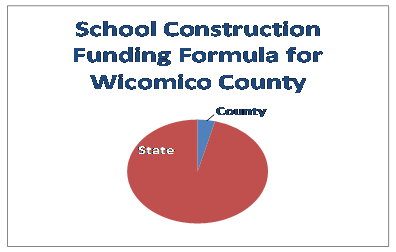 What this means is that county governments actually pay a much larger share of total school construction costs than the school construction formula implies. 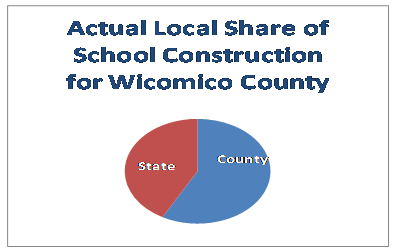 For example, the official wealth-driven State share of a local school project in Wicomico County was 96% for FY 2014. However, in the construction of the James M. Bennett High School, Wicomico’s most recently completed new school building, the final percentage breakdown on funding provided for the project to date is 52% Wicomico County; 48% State of Maryland and the budget estimates for the completed project anticipate a final funding split of 58% Local and 42% State. 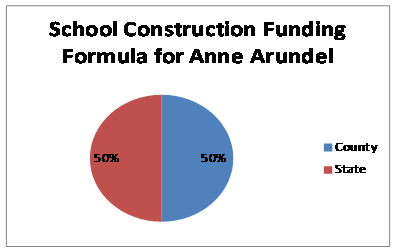 In Anne Arundel County, the State share of a local school project has been 50% for several years. However, in four recent construction and renovation projects, the actual State share of total construction and renovation costs was far lower – between 17% and 26%. For example in the construction of Belle Grove Elementary, the project total was $17 million, and the state contribution was $2.7 million, or 16.6%. For examples of the state-local share of other projects in Anne Arundel County, see Anne Arundel County’s State Funding of Total Project Cost Anne Arundel 2013.